The first time you arrive in Madrid you may ask yourself why all taxis are driving around with an image of a bear picking apples. You get to learn that it is Madrid's heraldry, and it is not apples the bear is picking. The first time the bear appears is in 1212, on the coat of arms the inhabitants of Madrid carried in the great settlement between the Moors and the Christians at Navas de Tolosa. At that time there where plenty of bears but no Strawberry trees. 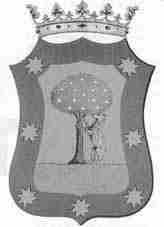 The heraldry from 1912 shows an eating bear with seven stars, like the constellation of little bear - La Osa Menor". In old writings the bear is written as "La Osa", the feminine form. In other words, its a she-bear who is picking berries. In a dispute over territory between the church and the city in 1222, the church gained the pasture land and the city gained the forest and the hunting rights. The church kept their heraldry with the bear standing on its legs and arms while the city changed it so the bear was leaning against the Strawberry-tree. The stars had eight edges and where placed around the bear on a ribbon. When Madrid became capital in 1561, the heraldry was crowned. Symbols where added and removed but today Madrid's heraldry is almost identical to the one from 1222, only a bit uglier, says Joaquín Carrascosa, who has written a book about the heraldry of Madrid. He want's a change it so the bear resumes it character of a she-bear. The stars also will have eight edges, so it doesn't get mixed up with military rank or the EU-stars. 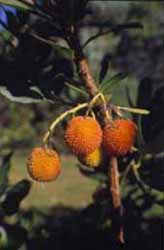 The Strawberry tree, arbutus unedo, is a tree or a shrub with a beautiful foliage, heather-like flowers as the same time as yellow-red berries, which may serve as an important nutrient supply for human beings, despite its stale taste and intoxicating effect at large consumption. The Strawberry tree occurs in the south of Europe and in Ireland. The berries are used for making spirits, "aguardiente", or as ornamental plants.